This is my second Kinder Cardigan from A Beginner’s Guide To Sewing With Knitted With Knitted Fabrics but was actually the only Kinder I planned on making. I knew I had a little less fabric than what the pattern called for but I thought maybe I could just wiggle the pattern pieces around. When I laid out my pattern pieces I discovered that my issue wasn’t how much length the fabric was but more how wide it was. I couldn’t place all my pattern pieces across it no matter how much wiggling I did so that is why I went with plan B and made it in the teal fabric as that is the colour I was able to order more in. 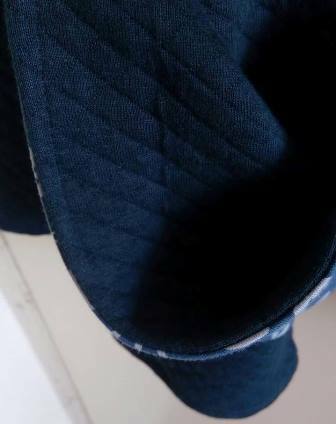 The blue is a navy colour but when you place it against other navy fabric like my work jumper you will see it is more denim navy not dark navy, this made it hard to match it up with other navy fabric in my stash. I placed the fabric back in my stash and thought maybe I would do some sort of skirt or something with it in the future. I was walking to work in my teal Kinder thinking I need to make another one as this is great. It seemed a shame that this navy fabric was sitting in my stash. I started thinking of other fabrics in my stash that I could team it with and then I remembered a remnant piece of sewing themed fabric that I brought last year. 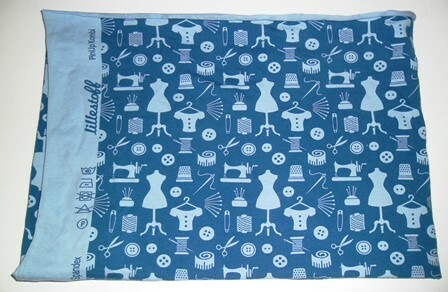 At the time I think the bower bird in me came out and I brought this fabric as it was blue and sewing related. To be honest I didn’t 100% love the fabric, it ended up being hard piece to match colour wise with other fabrics and was too small of a remnant to do anything with on its own so it just sat in my stash. Also it has a vintage theme to it and I’m not into vintage sewing. When I got home I pulled both fabrics from my stash and side by side they looked good together. There was enough contrast between the colours and also the texture and print was different on each one. 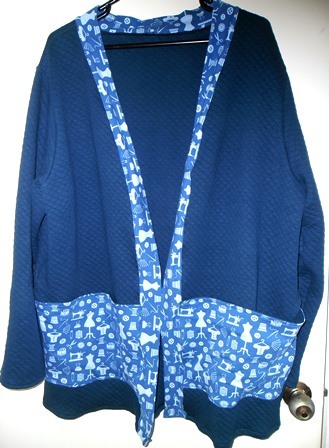 The problem I originally had was I couldn’t cut my neckband piece out for the cardigan, it is a long wide pattern piece and you need to cut 2 of them. Even though the sewing fabric was a lighter weight knit I thought it would still work for the neckband. 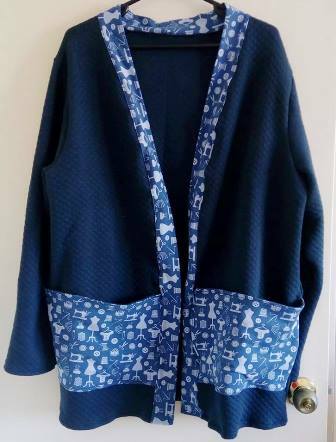 I didn’t want my cardigan to look like I had run out fabric and just threw on the sewing fabric for the neck even though that is the truth so I decided to make the pockets from it as well. 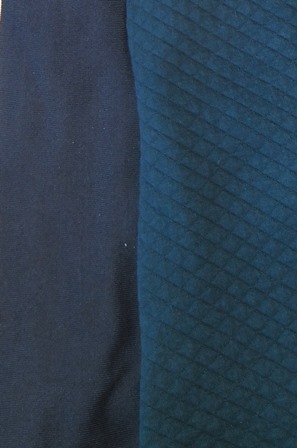 As mentioned above the sewing fabric was a lighter weight stretcher knit. I needed to stabilize the pockets or they would’ve looked misshapen. I thought about placing interfacing in them and then I though hang on I have scraps of the navy left I’ll use that. 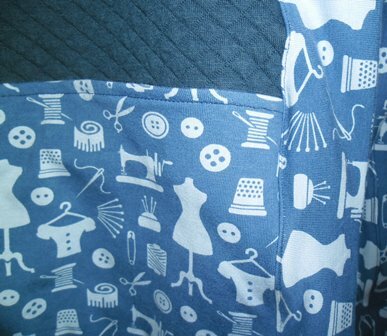 I cut out the pocket pattern pieces from both fabrics, I didn’t add any additional seam allowance as you fold back a large seam allowance in the original instructions. I stitched the 2 fabrics right sides together, flipped them over, top stitched across creating lined pockets which I just attached as per instructions placing them a little higher up than my teal kinder. When I taking photos of this when it was finished it immediately made me think of a “smoking jacket” and I started smiling and thinking it was a “sewing jacket” I placed a photo on Instagram and a dear friend who doesn’t sew wrote that exact comment about it which put me in fits of laughter. This really is my “sewing jacket” I am a bit of a sewing and craft nerd and for a number of years I have actually wanted to make a sewing themed item of clothing to wear to craft shows and events like that. I now have the perfect piece… and it has pockets! My teal kinder ticked all my things on my list to consider when making clothing but I think this gets a double tick on the creative side. The knit fabric I don’t look at as a vintage themed fabric now it is just a sewing fabric related to dressmaking which I like now. I am really proud of the cardigan, it got me thinking outside the box to make it. I loved that I was able to use the sewing knit that had been sitting around unused. I have worn this to work, worn it on a fabric shopping trip if I go to the craft show next month it will get worn to that too.